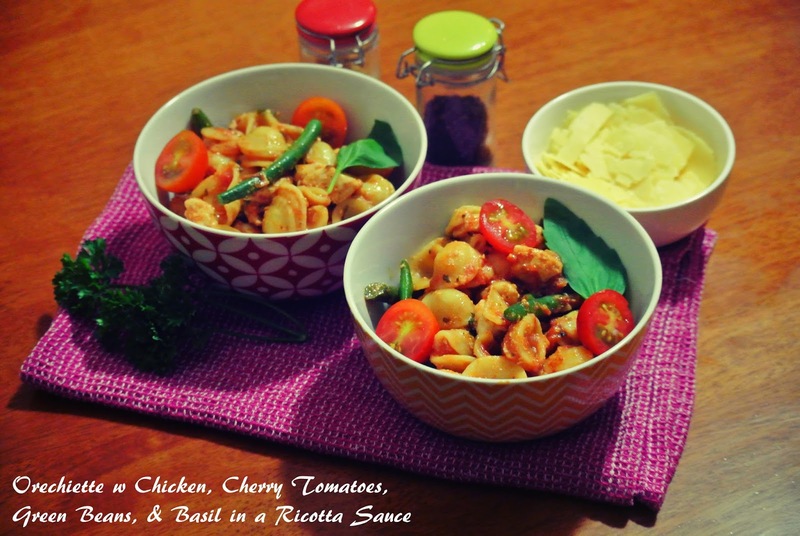 Quick & Easy Dinner Recipe using Barilla Australia Products! Barilla Australia were kind enough to send us a sample pack of a few of their products! We love Barilla products. Barilla uses the BEST quality Italian ingredients which make for incredibly delicious, flavour packed meals! We aren't big fans of store bought sauces, but we understand that sometimes you just don't have time to whip up your own. If your going to buy our top pick is Barilla. They know Italian food. The sauces and pasta are beautiful! Cook your Orecchiette al dente and set aside. Boil your green beans until tender and set aside. In a skillet with a tsp of oil ook your diced chicken until the juices run clear. Season with a little S&P. Drain your skillet. Add your ricotta sauce and allow the chicken to simmer in the sauce for 10 minutes. Add the rest of your ingredients (excluding the garnish). Toss until well combined. Let it sit on low heat for 10 minutes or until warm. Sprinkle a bit of shaved parm on top, throw in a fresh basil leaf and serve! *Special thanks to Barilla for providing AmeriAus with the pasta and ricotta sauce.